So here’s how we’re doing rhubarb this Spring. 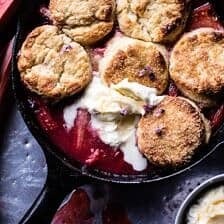 Roasted in a skillet, with tons of strawberries, some vanilla and topped with maybe the bestest honey butter biscuits ever. All served with whipped cream (or ice cream) and more warm honey butter for drizzling. Nothing super fancy, but does it really need to be? NOPE. So let me tell you guys something. Finding rhubarb where I live is the not the easiest of tasks. I’ve basically been calling Whole Foods every day for the last month and half looking for rhubarb. I actually call Whole Foods so much that the produce guys totally knows its me when I call in. The last time I called, I of course asked for rhubarb and he said, “I don’t have rhubarb, but I do have edible flowers today”. That was when I knew for sure, that I call there WAY too much. I’m either looking for edible flowers, or other odd somewhat in season produce that most larger areas have, but my smallish Whole Food’s doesn’t. I am talking about rhubarb, heirloom tomatoes, passion fruit, figs, blood oranges, etc., etc. So I just keep calling and calling until finally they get whatever it is that I’m looking for in, and then I pretty much jump for joy! Funny thing is when they finally got rhubarb in, my dad just happened to be shopping there and called me immediately to tell me the good news….and then I jumped for joy…for like a second…and then I asked, “wait, do they have the green tops on them? They have to have the green leafy tops”. Of course, they didn’t, but I kind of had to be happy they at least had them in, and take what I could get. Other funny part, I don’t even LOVE rhubarb. I mean, I obviously enjoy it, but only with other things…strawberries, raspberries, apples, you get the idea. It’s just that it’s spring and I have to bake with rhubarb at least once, you know?!? 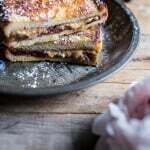 This is one of those simple recipes that you can serve for either brunch or dessert. In my house it’s brunch all the way, because we pretty much only do chocolate for dessert, but that’s just us. Really though this can and should be eaten whenever the heck you feel like it. It’s kind of freaking amazing, like sooo dang good. It’s also sooo dang easy to throw together at any given moment. Well as long as you have rhubarb, but even if you don’t, you could always double up on the berries or use apples, peach, or maybe even frozen rhubarb? Whatever fruits you can find will still be delicious. I do really, really love this combo of strawberry and rhubarb. I guess it’s a classic for a reason, huh? Truth is though, this recipe would be nothing without those biscuits. Of course, you NEED the fruit, but you NEED the biscuits just as much. Trust me on this. 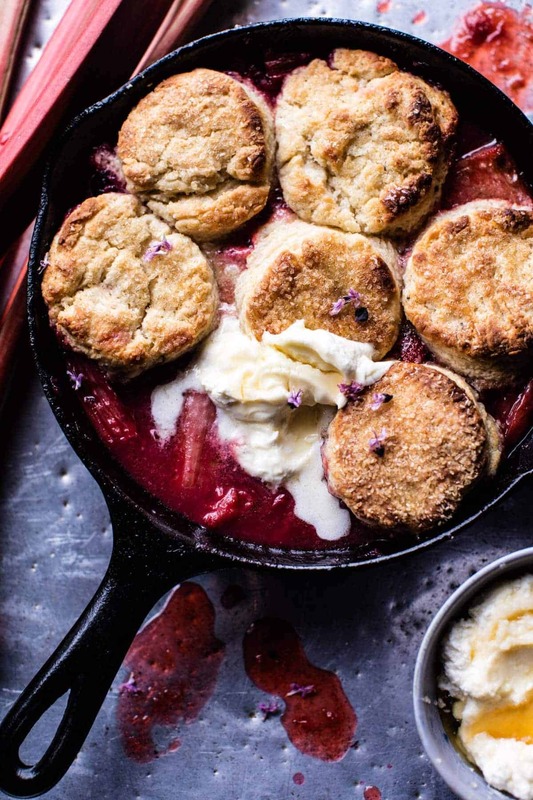 The biscuits are perfect for soaking up all the yummy juices that come from roasting fruit. Plus the butter, carbs and honey… need I say more? So what are we thinking here? Friday night dessert? Saturday brunch? Sunday lunch?!? Preheat the oven to 375 degrees F. Lightly rub a 10-12 inch cast iron skillet (or large pie plate) with a little softened butter or cooking spray. 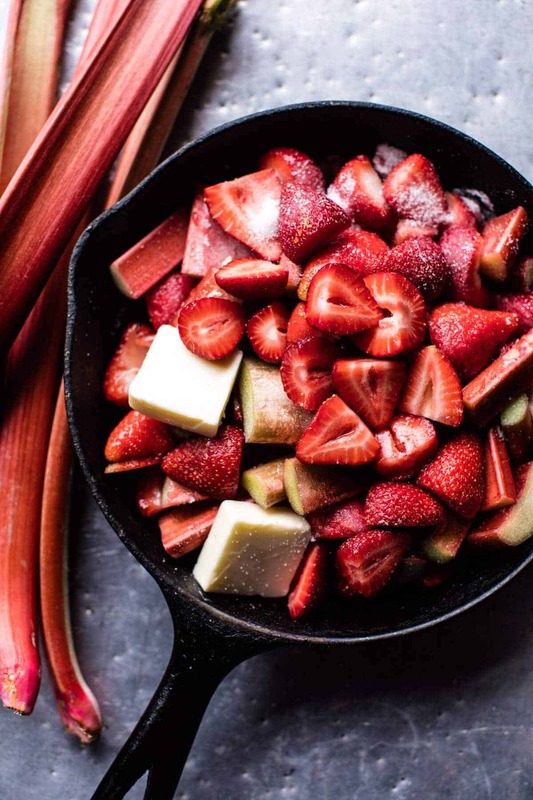 In the skillet, combine the strawberries, rhubarb, coconut sugar, lemon zest, vanilla and a pinch of sea salt. Toss well to combine. In a large bowl, combine flour and baking powder. Whisk until combined. Using a fork, pastry blender or your hands, add butter pieces to the flour and mix until coarse little crumbles remain. Whisk together the buttermilk and honey and pour into the flour. Stir with a spoon until just combined, trying not to over mix. Use your hands if needed to bring the dough together. Use a 1/4 cup measure to drop batter onto the cobbler or press dough out on a sheet of parchment paper or cutting board, and then use a biscuit cutter to shape the dough into rounds. Place the rounds on top of the cobbler. Sprinkle the biscuits with coarse sugar. 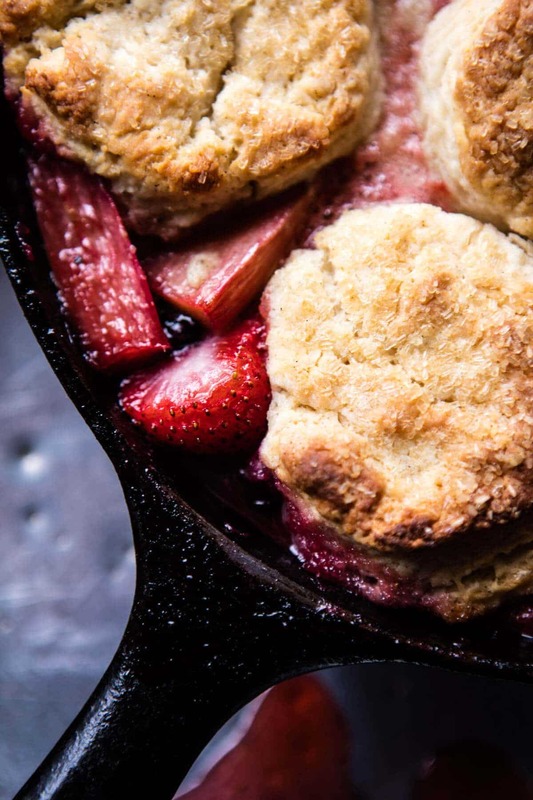 Bake the cobbler for 35-40 minutes or until the strawberries are bubbling and the biscuits lightly golden. In a bowl, stir together the honey with the melted butter. 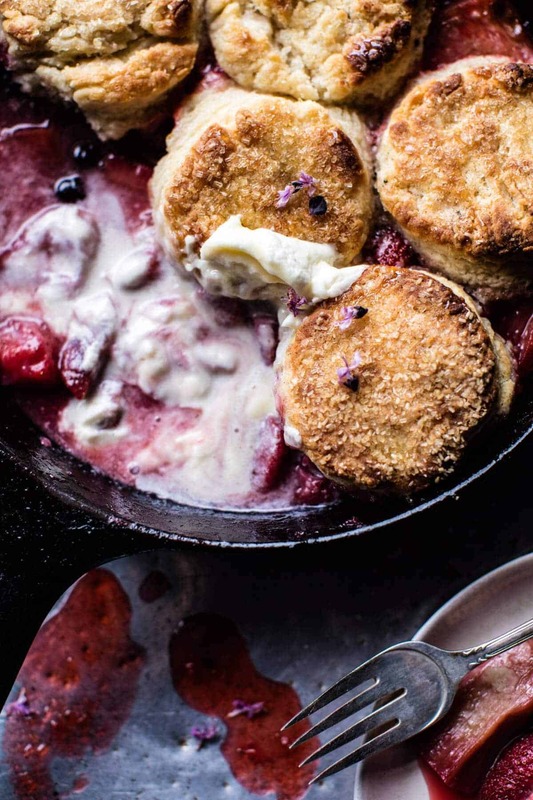 Serve the cobbler warm with whipped cream and a drizzle of the honey butter. EAT! 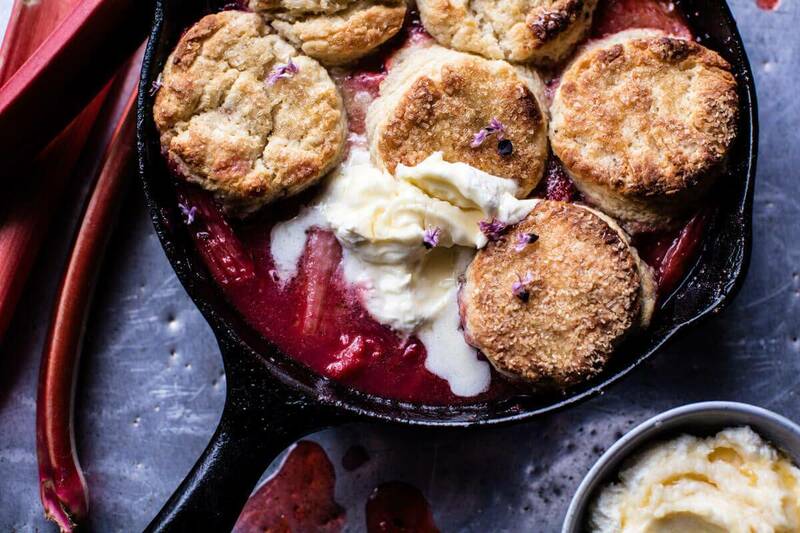 Off to bake some more Strawberry Rhubarb Cobbler… weekends, you’re the best! 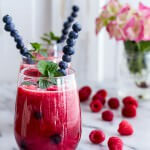 Raspberry-Rhubarb Bellini Smoothie w/ Blueberries (Virgin…or not so Virgin) (VIDEO). Dinner it is!!! Thanks Hannah! Rhubarb is something I’ve never had. In my life no one has ever mentioned it or fixed it. Your recipe looks really good but I don’t know if I want to try rhubarb?? You should!! Its so yummy!! Rubarb, I almost forgot about it! Definitely a childhood favorite. Need these biscuits in my life for sure! They’re a MUST!! Hope you enjoy! Ah, sadly I am not doing the rhubarb thing. 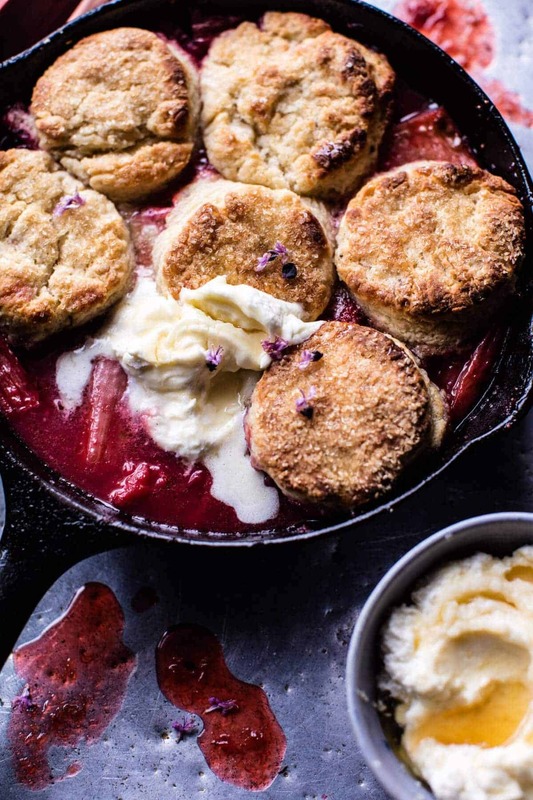 In Portugal you kinda need to rob a bank in order to afford buying rhubarb…, but hey, if you wanna send me a skillet of this, I won’t say no!!! Looks soooooo delightful! Thats so sad to hear! I wish i could!! Thanks Miranda! Haha, I love how persistent you are in getting the ingredients you want Tieghan! 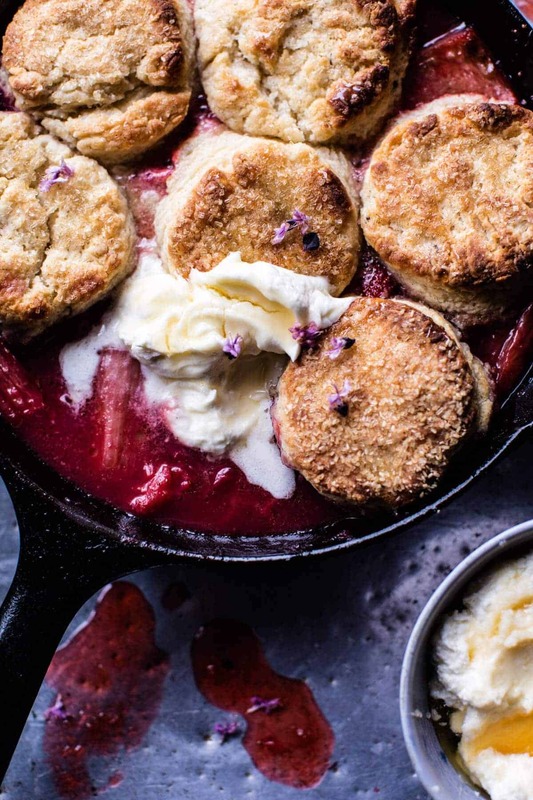 This rhubarb cobbler sounds delish and I completely agree that it’s perfect for Spring! Haha im pretty annoying about it!! Thanks Tori! I’ll be trying your recipe this weekend! Hi Vera!! Oh my gosh, that would be amazing!! I keep saying that I really need to move somewhere where things actually grow…ugh. Anyway, I am headed to check out all those recipes now. Thanks again and I hope you love the cobbler! ? Love this cobbler Tieghan! I love anything strawberry rhubarb, in fact, just picked up some rhubarb from my local market yesterday! Need those biscuits! Enjoy the weekend! You’re like me when you’re looking for something. I won’t give up! 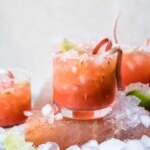 This looks amazing and am looking forward to making it when I can find rhubarb! I think so !!! Hope you love it Lili! Your recipes never cease to amaze me. 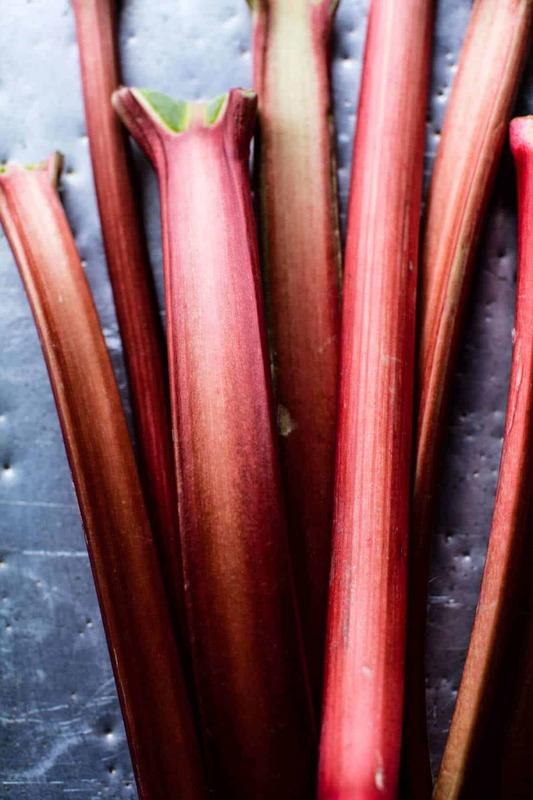 Having never tried rhubarb myself, I’ve been looking for a good recipe to try out that uses it, and I can’t wait to give this a try! Thanks Hope you love it Sam! I will have to adjust the sweetener in both ..as he is just on low glucose regime now. Will try Stevia and Blue Agave. The biscuits look delish.. Thank you. Ah Lucky!! Fresh rhubarb is the best! Hope you enjoy! This looks soo yummy! Rhubarb and strawberries – that’s the best combination. I used to buy strawberry-rhubarb pastry every morning up until the shop stopped selling them 🙁 In Spain shops don’t sell fresh rhubarb at all and never seen any canned ones either. Thank you!! Thats such a bummer!! lol about Whole Foods knowing you by name, that’s hilarious. such is the blogger life! 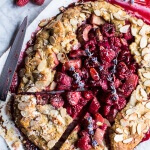 Rhubarb anything is a win in my book – this looks amazing! Always nice words ? ?Thanks Ellie! Yay for strawberry season! 🙂 This is so stunning and the honey butter biscuits are everything! Im excited about it to!! Thank you! Please explain – Why does the rhubarb have to have the leafy tops attached? Is it because it starts to lose it’s flavor after the greens are cut off? Isn’t that the poisonous part of the plant? Which is why they cut it off before putting it in the stores? HI!! I only wanted the green leafy part attached for photo purposes, not to bake with it. SO SORRY if that was confusing. I just love the way the rhubarb photographs with the greens still attached. Please let me know if you have other questions. Thank you! Rhubarb is so great right now!! Never had rhubarb before but I love strawberries. I don’t think I have ever seen rhubarb but I will give this a try. Quick ?. Are you baking with high altitude in mind? We recently moved to Boise, Idaho and not sure about the adjustments for baking. We are at about 2800 ft.
HI! I do not like to adjust for high altitude as I find I do not like my results when I do. This recipe will work great at 2800 ft. I am at 9000ft, so you should have no issues. Thank you and please let me know if you have any other questions. Hope you love the cobbler! thanks for the article, hope to have more not wait to prepare it here at home! I wonder if the rhubarb is in at my local Whole Foods yet? This looks amazing Tieghan… I’m thinking it’s a brunch option at our house! Its just coming into season so hopefully!! They would be great for brunch!! This looks incredible. I just love rhubarb! And this is a lovely alternative to crumble. This is one sweet,savory biscuit recipe! This looks incredible!! I’ll definitely try this–I love that everything cooks at once and you can just pop it in the oven and forget about it. Gorgeous photos, as always! This is unbelievably beautiful. I haven’t yet found rhubarb, but when I do, I’ll be making this! I made this cobbler on Sunday to take to a dinner at our friends’ house and everybody loved it, kids and grown-ups alike! The only adjustment I made was adding a little cornstarch to the fruit to thicken the juices a bit. The honey biscuits are sooo good. Thank you for the recipe!!! So amazing! I love that everyone liked it!! Nice touch with the cornstarch! Thanks for making it Vera! This looks scrumptious! My husband is obsessed with strawberry rhubarb pie so this will be a much easier Father’s Day substitute for this new mama! One question, he’s lactose intolerant. Is there a substitute for the buttermilk in the biscuits? Thanks! Hey Alicia!! You can use almond milk or coconut milk instead of buttermilk. Please let me know if you have any other questions. Thanks!! our, as it seems so perfect! Thanks for sharing. **Little modification: I added one teaspoon of cornstarch to the fruits because I was using frozen strawberries and did not want the mixture to be too liquid. Enjoyed your post. My mother was from Denmark and I spent many summers there as a child. In Denmark one of the national dished is Rod Grod or red pudding. In early summer my grandmother (Mor Mor) would make different varieties depending on what was available. My grandfather used to take a 45 min bus trip to go directly to the farm to get fresh strawberries warm from the field. One variation was strawberry rhubarb, we would also enjoy current strawberry and she also made a green pudding or gooseberry. It was served with a sweetened heavy cream in a big bowl room temperature a couple of hours after it was freshly made. YUM!!! WOW! That sounds absolutely amazing! 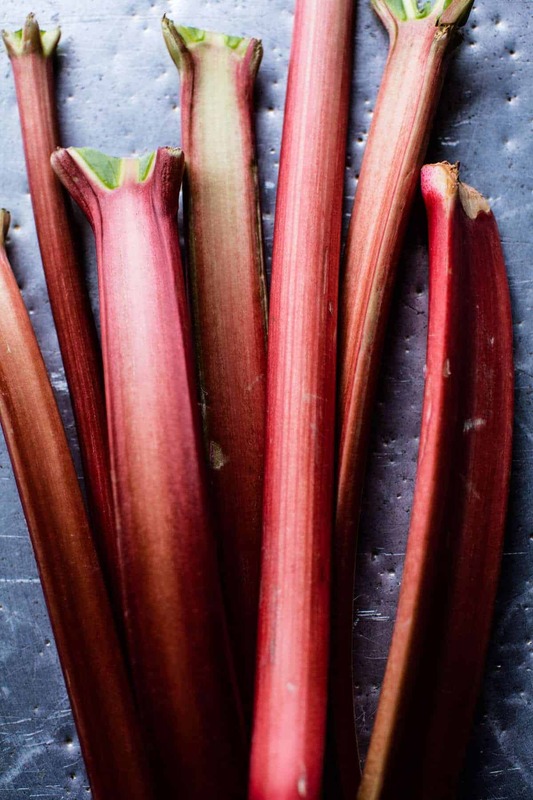 I just found rhubarb at my local grocery store and can’t wait to bake this! One question – it looked like there were pieces of butter in with the strawberry/rhubarb mixture, before the biscuits were put on top. I didn’t see anything in the instructions for butter to be added to the fruit – did I miss something? Thanks! Hey Jen!! Nope, you didn’t miss anything. I ended up liking the recipe with the butter out of the fruit and instead used for topping. That was a prep shot before I perfected the recipe. So sorry if that was confusing for you. Let me know if you have questions. Hope you love this! I would really like to make this this weekend. I am surprised that there is no thickener included in the recipe – I saw that one person added cornstarch. Not too juicy?